New at Milk – Mesh Feet! These great mesh feet are a new release from Milk! They come in a flat and tippy toe version. Both of these sets of feet are rigged, meaning that they move with your avatar. These feet also come in 11 different sizes so you’re likely to find some that are a perfect fit for your avatar. Included with your feet are 6 different sock layers, in varying shades, to blend your mesh feet with your avatar’s legs. If you’re anything like me, tinting or matching feet is not the easiest thing(nor my favorite thing to do lol) But luckily, these only took me about 7 or 8 minutes to match up. So they are pretty easy for the average SL’er to use. Matching and tinting is done with an included HUD. 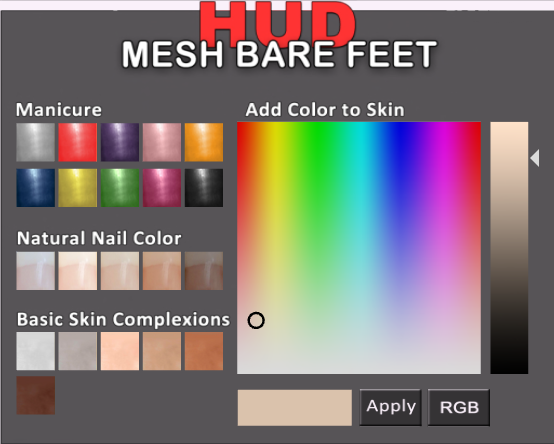 This HUD has several basic skin tones as a starting point ranging from light to dark and even has a grey option. Then you can tweak the RGB values with a color picker and lighten or darken with an option to tint them. As for the toes on the feet you have several natural nail colors to chose from and then 10 different manicure options.